In Volume #6, Roman will provide you with an invaluable guide to players that do not want to spend a lot of time studying and but still want good results. Based on his own games Roman recommends solid active lines to meet e4, d4, c4, and Nf3. 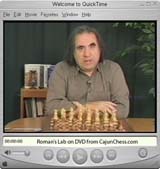 Your study time will be cut dramatically as Roman gives you the best and most solid responses for Black. This video was designed for the player who does not want to spend a lot of time studying and still achieve good results.